Airbnb is trying its hand at the Apple Watch, with a new app that aims to provide a quick and easy way for hosts and guests to message each other. On Thursday, Airbnb users who've downloaded its iOS app and have an Apple Watch will receive the new app through a software update. The app isn't Airbnb's existing iOS app beamed to a smaller screen. It's an entirely new app coded from scratch, aimed at making it easy for hosts and guests to stay connected on the go. Airbnb's existing mobile apps -- and its desktop site -- let users message each other, often during the booking process and during their stay. The Watch app is designed to provide more speed and simplicity, for when users don't want to pull out their phone. It lets guests and hosts send each other messages, either by dictation or by selecting from preset responses they can create in their Apple Watch settings. The app was designed for hosts in particular, especially those who might be constantly bombarded with similar sorts of questions. A preset response might come in handy when guests constantly ask what the Wi-Fi password is, for instance, or need directions. Hosts can receive booking requests through the app, containing the traveler's name and photo, requested dates, and a message from them. Hosts can then accept or decline from their wrist. If a host accepts the request, the guest is notified and can respond on his or her own Apple Watch, using the dictation feature or with a preset response. 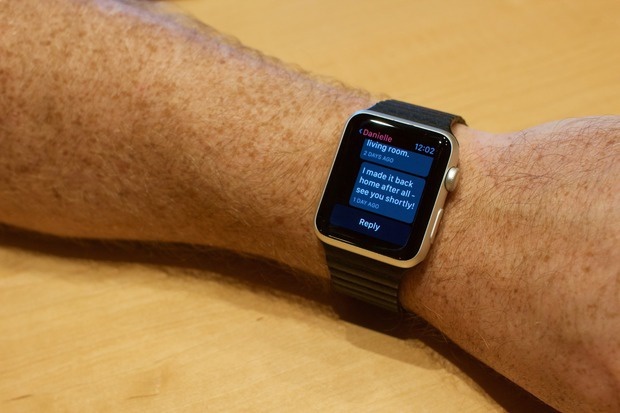 Airbnb Apple Watch users can send messages either by dictation or through preset responses. The Watch app doesn't include other features outside of messaging. Travelers must still search for listings and submit booking requests through the site or the other mobile apps for Android and iOS. But with the Apple Watch, "Apps that try to do too much end up letting you down," said Scott Raymond, engineering manager at Airbnb, during a demo at Airbnb's headquarters in San Francisco. Airbnb users frequently use the company's messaging service before, during and after stays, the company says, and the Watch app offers a streamlined way of doing so. Not all Airbnb users will regard messaging on an Apple Watch -- which does not have a keyboard -- as practical. Many Airbnb users won't even own the Watch, which only recently went on sale, at a starting price of US$350. But Airbnb's app shows a desire to get a foothold in wearable computing, which could eventually become a mainstream platform. Other online service providers and publishers, like Yahoo, Yelp and The New York Times, have released their own apps for Apple Watch. Airbnb's service is already integrated with Apple's Passbook, which is built in on iOS devices and on the Apple Watch. That feature lets Airbnb travelers receive alerts about upcoming reservations, or access information about their booking. Airbnb also has some integrations with smartwatches powered by Android Wear, to provide notifications to users about bookings.